I am, admittedly, a meat-loving Midwesterner who rarely gave much thought to vegetarian dining requirements. When I married a very strict vegetarian a few years ago, I learned quickly that many restaurants’ “vegetarian menus” consist of a house salad and marinara sauce. Since we relocate and travel frequently, researching restaurants that accommodate his diet can be a challenge. VegOut from Front-Ended seems perfectly catered to traveling vegetarians like him. Eat Your Vegetables: VegOut lets vegetarians find places to eat nearby, categorizing results as vegetarian, veg-friendly, or vegan. 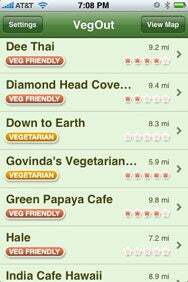 The app—currently on sale for $3—uses the social network HappyCow to identify and categorize restaurants as vegetarian, vegan, or veg-friendly. It also leverages either GPS or a manually entered location to list nearby restaurants. VegOut makes essential information—like type of cuisine and price—easily accessible. The app integrates well with Google Maps, allowing you to view either an individual restaurant or the entire results list on the map. Since HappyCow’s community is international, globe-trotters can take advantage of the application as well, though some regions have greater community involvement than others. VegOut is a handy reference for any vegetarian or vegan, but it isn’t perfect. The app uses a built-in Web browser to display reviews on happycow.net; compared to Yelp’s ( ) native display of comments, this seems a little weak. Moreover, the app doesn’t support user interaction with HappyCow: users can only post reviews or rate a restaurant by using the site’s Web site, instead of a native interface on your mobile device. VegOut is compatible with any iPhone or iPod touch running the iPhone 2.x software update.